Los Angeles Dodgers third Baseman Justin Turner. MILWAUKEE, WI—The Los Angeles Dodgers have tied the series against the Milwaukee Brewers and now have the home field advantage. They defeated the Brewers 4-3 on Saturday, October 13. Both of the first two games have been tightly contested. The first four innings were scoreless for both teams. Brewers pitcher Wade Miley had a strong performance, helping his team grab the lead in the bottom of the fifth inning. Shortstop Orlando Arcia started by slamming a home run down the center. Then, Miley scored off a Braun groundball bring the score to 2-0. Milwaukee extended their lead in the bottom of the sixth inning, after baseman Travis Shaw crushed a Wood pitch and made the score 3-0. The Dodgers looked dead in the water, but they responded in a big way. In the top of the seventh, infielder Max Muncy scored off a Bellinger single. Machado made the score 3-2 when he scored thanks to catcher Austin Barnes being walked. The Dodgers would take the lead for good in the eighth inning after third baseman Justin Turner hit a clutch two-run homer down the left side. Dodgers added to their score thanks to outfielder Chris Taylor scoring a run. 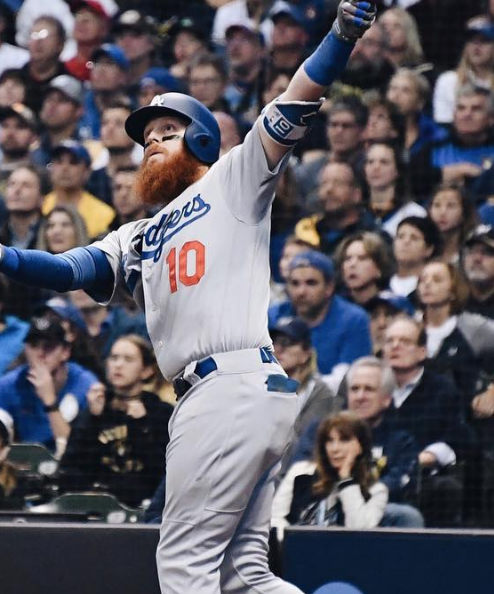 The Dodgers will face the Brewers once again on Monday, October 15 in Los Angeles.